So.. you all know the ISS-Above devices lights up and makes a general “kerfuffle” when the ISS passes overhead. That’s all very nice of course. But I just realized I want to allow someone who is nearby the device to interact with it in other ways… and to be able to see more information. But… how to do that if the ISS-Above has not got a “regular” display attached? Simple… I wrote some additional code that implements a WEB SERVER right on the device. Now.. anyone who is nearby can just tap in a URL that will connect to the device – which will then respond with a web page with lots more information. e.g. This is what I have currently working on the beta version of the device. I have MANY more ideas on what I can do with this little web server on the Pi. Wait and see. Let me know what you think in the comments. THANKS! Want to join the ISS-Above beta? All you need to get started is to purchase the basic elements. 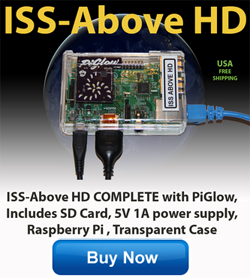 I recommend purchasing a kit – which includes the Pi – plus power supply / case / SD card (with the Raspberry Pi’s operating system pre-installed). This particular kit does not include a WiFi adaptor. You will need to connect this to your cable modem/router via an ethernet cable. If you prefer to use a Wifi adaptor I recommend this one. As you’ll see from the “Version” menu above I’ve listed the “display” devices I have already got working with the ISS-Above software. Just pick whichever device you want to use. I would recommend the PiGlow for it’s simplicity / low cost and how colorful it is. At just $12.99 in the USA it’s quite a bargain. While the setup does not need you to be a “computer expert” you may need to learn some new tricks with regards to working with Linux (rather than Mac OS or Windows). It’s not a difficult thing to do… and I personally had virtually no experience with Linux before doing this. I’ll be sure to help out in any case with any questions you may encounter. 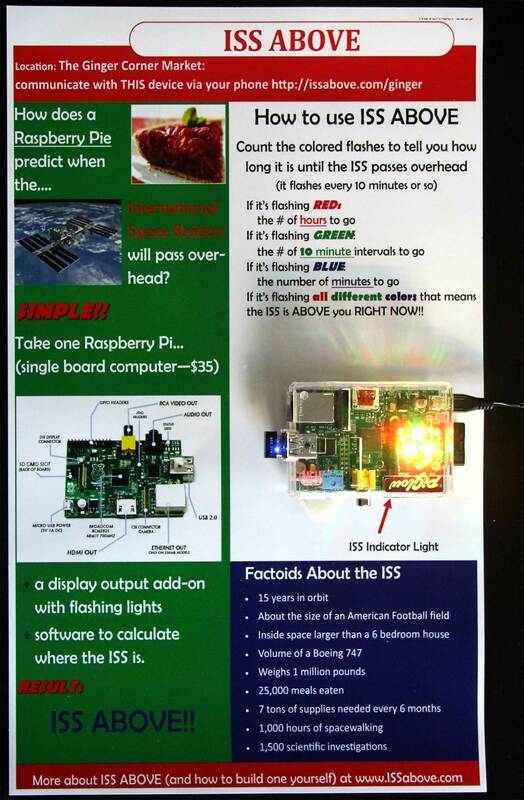 Before installing ISS-Above you will have to run through a basic setup of the Raspberry Pi. To do that you’ll need to connect the Pi up to a monitor/TV using an HDMI cable and a USB keyboard. Basic setup instructions for the Pi can be found here. Those instructions are actually more than you will need to do. If you ordered the kid I specified above you will already have the SD card already setup. So you can literally just plug everything in and power up. Then select the correct operating system from the menu (the one for Raspbian). To do some of the setup (especially related to getting ISS-Above working) you’ll need to be prepared to type in simple text commands to the Pi to install certain code libraries from the internet. It’s a very quick setup I promise.